Do you use a travel packing list? There is no single travel packing list or travel packing guide that will suit every occasion. It very much depends on where you are going, the purpose of your visit, what you intend to do and how long you are going to stay. Not forgetting of course, that whether you are male or female is also a significant factor. But of course there are some things that are always needed when you go to Bangkok and there are some things that are more likely to be forgotten than others, so it makes good sense to follow a travel packing guide. A travel packing list is the best way of ensuring you take only the essentials and do not weigh your luggage down with non-essential stuff. Remember, you will always bring back more than you take, so your suitcase should not be more than 75% of your weight limit on the outward journey. If you have a 20kg weight limit then try and pack your suitcase to about 15kg so that will give you enough room to pack all those gifts and cheap clothes that you come across in the markets. If you are tempted to pack something "because I might need it", don't, you won't need it, believe me. Take only the bare essentials. The best I can hope to achieve here, that meets the needs of all travellers, is a travel packing list that acts as an aide memoire for you. I have prepared the following travel packing list over the many years that I have travelled the world. I packed and unpacked my bags countless times, very rarely did I forget anything when I followed this travel packing list. After each completed trip there were either additional things I needed to take next time, or things which I took and never used and so the travel packing list was refined. This list is prepared from my years of experience and I hope you find it a good starting point for your own travels. If you think that it could help you then there is a printable travel packing list that you can download and use lower down the page. If you are going to Bangkok then you will require a suitcase and a carry on bag. There are many travellers, particularly business travellers who take bags on board the airplane that are above the size limitations. These bags look like a small suitcase and I am not sure why they are allowed, as they exceed both the size and weight limits for carry on luggage. I am only going to cover what I know is allowable luggage, because whilst rules can be bent they can also be enforced and usually at the most inconvenient time. 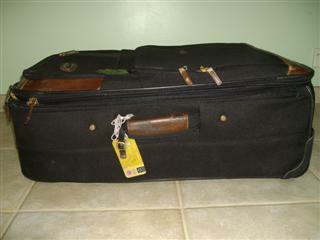 The choices of suitcases are limitless, however they are basically split into hard and soft suitcases. Most travel websites seem to recommend the soft sided suitcase as being more durable and because they have flexibility you can squeeze that bit more into them. What you will notice though is that airline cabin crew always have hard suitcases, so go figure that one out. Unless you fly very frequently I suspect that the investment in a hard shelled suitcase is not worthwhile. 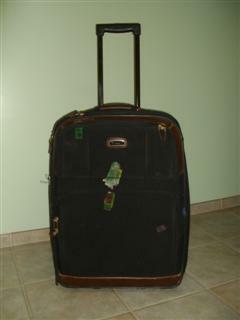 The soft suitcase is preferable and you will find them very durable. There are also constraints that you need to work within such as the allowable bag dimension for cabin luggage and weight of the bags, both checked and unchecked. Check with your airline for these details. If you have to change airplanes ensure that both airlines have the same rules. There are some differences between European and USA airlines in terms of the amount of baggage you can take that you should note. Some airlines use the "piece" concept and some use the "weight" concept, you need to check this out before you go. I have a soft suitcase made by Tosca and it has served me well and has been through the baggage handling processes about 60 times and has no major damage to it. I see no reason why it could not be used another 60 times. In fact I will probably never buy another suitcase in my lifetime. Update September 2010. Whilst travelling on business my suitcase was lost after being checked in at the airport. If you would like to know what happens when your baggage is lost and how you can make an insurance claim, then go to this page to learn about lost baggage. I bought my Tosca suitcase in a department store sale for less than $100 in a 50% off sale. I am extremely happy with its performance, the zips are strong and sturdy and it has a handle and small wheels to pull it along so I don't have to carry it. Update 2016. My Tosca suitcase lasted until mid 2016 and then the wheel broke off during a flight to Bangkok, it probably could have been repaired but I went to get a new suitcase anyway. The new suitcase was about the same size and was branded as American Tourister and had a fluorescent green strip on the front for easy identification. One advantage of the soft suitcases is that some of them can have be expanded by unzipping a flap. This feature has saved me many times when I bought more things than would fit into my suitcase. The days of having to carry a suitcase have long gone and you will find that the two most important features of a suitcase are that it should be expandable and have little trolley wheels and an extendable handle. If you choose a well known brand I don't think you need to spend too long agonising over whether to get the red one or the black one, just buy it and you probably will have something that will last you many years and give you great service. When the airlines restricted the amount of liquids in hand luggage it made a lot of people really evaluate the importance of what they were carrying onto the airplane. Many people found they could replace the standard airline cabin bag with a backpack. In this way you can reduce the carry on bag weight dramatically by transferring many things over to your suitcase. The international travel packing list was revised accordingly. 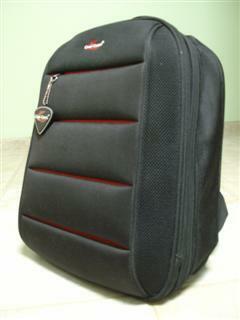 The most affordable laptop backpack I have come across is the Coni Cocci brand, the same as in the graphic above. You can read more about the Coni Cocci laptop back pack and where they are available in Bangkok. I have made a printable travel packing list available for both the carry on bag and the suitcase. Like most people you probably pack too many things when going on holiday. In fact I am also guilty of doing this, so have a look at the following travel packing list guidelines to help you decide what to take. Irrespective of how long a trip is only take enough clothes for four days. On day three send the dirty clothes to the laundry. 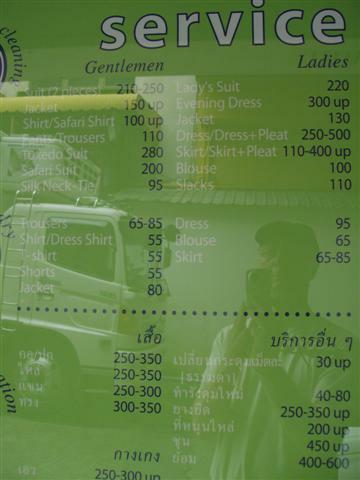 The cost to wash business shirts, underwear, socks and trousers is about 1800 baht, but if you are on holiday and wearing t-shirts instead of business clothes then the cost may be around 800-1000 baht. If you are on a tight budget then you may find that the hotel laundry service, whilst very convenient, is not that cheap and you could consider dealing direct with the laundry yourself. You should find a laundry shop close to your hotel and if you use the laundry direct then expect to pay about 300 baht for this amount of washing. You should be able to collect it the next day if you can deliver it by 10:00 am. Clothes are very cheap in Bangkok and the hotel laundry cost can actually equal the price of a new garment. So another option you have is just go and buy some new clothes and wash the dirty ones when you get home. This is actually a viable alternative and one I have done on a number of occasions. It is another good excuse to shop. The local laundry price is now around 70 baht per kilo but if you are in the tourist areas then you can expect to pay much more. The travel packing list is a good place to start, when packing your suitcase. You will find it helpful to imagine each stage of the journey. Firstly consider what you will wear to get to the airport and on the flight. Then work through each day of your Thailand trip and what activities you will do and get out those special items. Stack them in a pile in front of you. Shoes: An enclosed pair for general use, such as a pair of trainers or a sports shoe. Trainers are comfortable to walk about in and also let your feet breathe in the hot climate, they are also acceptable if you visit the temples. An open pair, such as sandals, flip flops, Beachcombers, Surfer Joes are great for the beach. Have a look at mine, cool eh. Shorts and Trousers: Two pairs of long trousers and one pair of shorts. A casual pair of trousers for everyday use and a smarter pair for the evening. Even with the hot climate in Bangkok the only men that wear shorts in the city are tourists. I would suggest that you keep the shorts for the beach. Belt: To hold up the trousers. The type where the metal buckle detaches from the leather belt is ideal when you go through the metal detector at the airport. It saves you having to remove the whole belt and then rethread it. Shirts: A mix of t-shirts and smart casual shirts. Hat: Hat or baseball cap. It will protect the top of your head and face from the sun when you go to the temples or to the beach. Sunglasses: Not so much for darting in and out of the shops in Bangkok but certainly useful if you go to the beach. I always carry Imodium in my wash-bag but have never had to use it on my visits to Thailand, but I had to use it twice in India and I will let you draw your own conclusions from that. When researching the topic of diarrhea I found a lot of people recommended to drink 2 tablespoons of Apple cider vinegar in apple juice as a cure and others had tried Turmeric with success. If you are interested in finding out more then go to this folk remedy site. Luggage Tags: Put luggage tags on each of your bags with your name and address so you can identify it as your own. Some airlines give you the option of printing an identifier page when you check in on-line. You should put this printout inside your suitcase, on top of your clothes. Perhaps if I had done this on the China trip I might have got my suitcase back. Put some distinctive tape or stickers on your bag also so that you can see it clearly as it comes off the carousel. You will be surprised how many bags look alike when you come to collect it. The added advantage of making your bag distinctive is that it will stop someone else taking your suitcase in error. Don't use big pieces of ribbon that hang loose as they can catch on part of the conveyor system and rip your bag to pieces. This now completes the travel packing list of essential items to take on a trip to Bangkok and I hope that you develop your own travel packing list based upon this template. Here is a printable packing list available for both the carry on bag and the suitcase.